This one of a kind CD is the only recording authorized by Mother Teresa before her passing in 1997. GIFT OF LOVE is a collection of songs written to her words and prayers. The songs, written over a period of ten years, are some of the songs written by the composer and performer, Bradley James, for Mother Teresa and her Sisters, the Missionaries of Charity and are sung by the Sisters in their homes and convents all over the world. The recording contains Mother's voice, which is blended into the moving and inspiring songs. The liner notes contains Bradley's stories of how each song came about. There are also copies of some of Mother's personal letters to the composer. This contemporary collection features original songs including MOTHER'S BUSINESS CARD, DRAW MY HEART, a new and inspired AVE MARIA written for Mother on one of her trips to her native Albania with Pope John Paul II, and a new and completely original gospel version of Mother's favorite prayer of Saint! Francis of Assisi, PRAYER FOR PEACE. BRADLEY JAMES…A true teacher at heart, Bradley shares his true stories of his 12 years of knowing Mother Teresa and 15 years of work and friendship with her Sisters, The Missionaries of Charity, in such places as San Quentin Prison, Tijuana, Mexico, the South Bronx and their orphanges and AIDS houses. A professional singer and performer, Mother Teresa gave Bradley exclusive world wide rights to write and record music to her words and prayers. 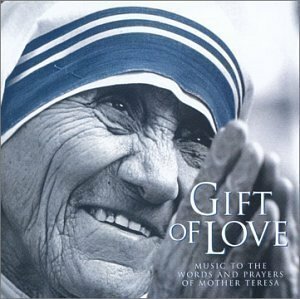 These songs are the internationally acclaimed CD, GIFT OF LOVE, MUSIC TO THE WORDS AND PRAYERS OF MOTHER TERESA. Bradley’s high profile audiences range from Forbes 400 CEO’s to Hollywood and Broadway Stars to kindergarteners. Bradley developed the highly successful s.t.a.r.t. seminars which he is asked to present in corporate boardrooms, universities and prisons and to individuals all over the US. He is also founder of ONLY LITTLE THINGS MUSIC, which produces and promotes his music. He can be heard singing and playing the piano in New York, Los Angeles, San Francisco and Palm Springs.